A few friends have asked to see the photo studio picture of all of us in kimonos from 5 years ago so I decided to put it here on the blog where anybody and their cousin can see it. So far, the tiny outfit L is wearing gets the most comments. What a fantastic 7-5-3 photo! I've never seen any quite like it. 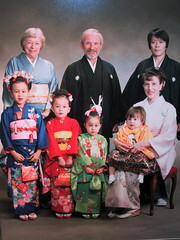 Your family must have gotten such a kick out of dressing up in kimonos for the photo!